En bruksfärdig sammankopplad orange strömkabel som underlättar inköp och installation. LTLN ✔ - - Fluorescent light to be mounted in the hole pattern on the enclosure's frame. Orange anslutande kabel mellan LTLN-lampor. 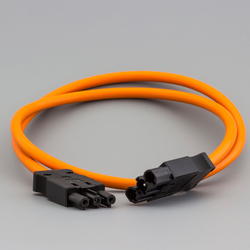 Orange interconnecting cable for enclosure lights, LTLN. Off the shelf solution, the cable easily connects multiple enclosure lights together. Ready to use cables, simplifying the procurement and ensuring that the lights can be installed easily. Orange cables are normally used to denote that the cable is live, even when the main power switch has been turned off.